Can we stop with the 9-11 already? The hypocrisy is eating at my stomach liner. Look, the terror attacks were a disgraceful, disgusting event the likes of which this country has never known. I get it. Like most Americans, I was at first sickened, then angered by the actions of 20 representatives of "The Religion of Peace." Unlike most Americans, I am still angry. I am still of the opinion that every Muslim extremist should be hunted down and killed like dogs - of course, these toads are about three evolutionary steps away from canine status, but I digress. When the libtards and the "moderates" were ripping Bush for acting too hastily and too aggressively, I was shouting, "He's not aggressive enough!" in my basement bunker. I wanted to invade Iraq and Afghanistan. I want to invade Iran, Syria, Lebanon, Egypt, North Korea, and France until the job is done. If it were up to me, the Middle East would now be the largest empty parking lot on God's green earth. But that's just me. 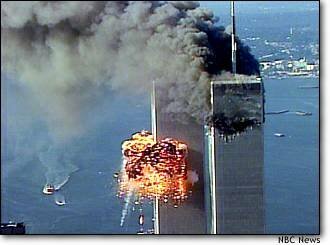 But if you think I have reserved all of my anger for our scumbag Muslim friends, you are gravely mistaken. Many folks in America have a place at my table of bile. Hell, Jay Rockefeller can sit at the head of it, after he just stated that the world would be better off if Saddam Hussein were still in power. He didn't say that in 2001. He said that yesterday! Ya know, I tried to avoid the television all day (except for football, of course) because I couldn't stand all the hypocrisy. Everyone in the press, politics, and on television wants to give remembrance and observe the solemn occasion. Why? You all are just gonna go about your lives as if nothing happened tomorrow! These same people who are putting out their flags and calling the talk shows weeping about the tragedy are the ones who will cry that the Patriot Act violates their civil rights, and airport screeners shouldn't pick out young Muslim males! It's like those dirtballs who engage in the Christmas spirit during a few days in December, then go out and stab their girlfriends by New Year's Eve. Give me a break! If America is going to go hog wild with 9-11 stories just because it's the fifth anniversary of the attacks, then don't bother at all. If America is going to go after terrorists around the world, but only do it with concern to their civil rights, then don't do that, either. What's the point of doing a necessary job if you only do it half-assed. The victims in the WTC and the Pentagon were not heroes. They were victims. There's a difference.